Negotiating vendor contracts is never easy. You need strong relationships with your vendors to grow and expand your business, but rushing to sign on with companies may lead to higher risk deals. Your short-term needs may get met, but you suffer over the long-term from it. If you do not have the technology and relationship to scale effectively and securely while maintaining compliance you may not be able to keep up with your competition and customer/client demands. Vendors are essential to your business, but you are fundamental to theirs as well. A mutually agreeable contract is useful for both parties, so it's important to work out a deal that gets you what you need. 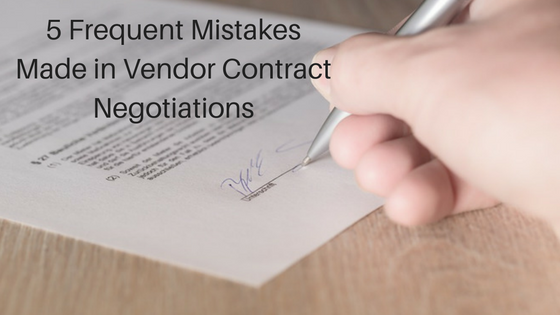 Keep an eye out for these five frequent mistakes made in vendor contract negotiations. Make a priority list of vendors long before you enter into negotiations. Your top-choice businesses should meet all your requirements, with the experience, infrastructure, contacts and reputation needed to stand out in the crowd. You are willing to compromise with these vendors on certain aspects of the contract. The companies further down the list don't have as much to offer, so you can take a harder stance on your desired contract. These vendors may be new to the market or otherwise eager to have you as a customer. They're more willing to bend over backward to get you favorable terms and win your business. Once negotiations are underway, it's easy to get carried away and accept a price that's much higher than you should be spending. A vendor could offer everything you want and more, but if it doesn't fit into your budget, then it's a waste of your time and the vendor's to try to make it work. You might pull off the higher price for a short period, but the impact of the decision will be felt throughout your organization. Before you start talking about money, set an absolute maximum price for the contract. If you can't get the vendor to meet it, be prepared to walk away. The supplier may show flexibility in the financial requirements once it becomes obvious the deal may be lost. If you really want to partner with this particular company, offer to drop less essential elements in an attempt to reduce the cost. If things don't go your way, continue to the next vendor on your priority list. When you have multiple vendor options, you never feel backed into a corner and pressured to take a deal that is truly impossible to fit into your company's budget. Come explore our comprehensive guide to security budget planning today! Do you know the potential risks of partnering with each vendor before you enter negotiations? Do your due diligence to know what you're getting into ahead of time. SAvailability delays, shoddy service, and unexpected project or conversion costs can create major problems for your organization. Even vendors with impeccable reputations may end up being a poor match for your company. If the principle location of the vendor is unable to meet critical recovery or service needs simply because of travel times, then your risk assessments may end up showing a higher risk than acceptable. Once you attempt to fix these problems, it takes far more time and resources than simply doing the research before you sign on the dotted line. Are you asking for enough in negotiations? You may be so focused on completing negotiations that you forget the vendor is also assessing you as a potential customer. When you're talking to multiple vendors as potential partners, you have room to negotiate for what you want. Don't be afraid to ask for more, especially if you have several strong prospects. If they hear that their competitors are unwilling to accept a particular clause, they may choose to step in to show their flexibility. This helps them make an excellent first impression on your company, which makes you more likely to recommend them to business colleagues. It works out well for everyone involved. It can also provide useful to engage with a client like Garland Heart to handles the negotiation for you. This will allow for a better utilization of you and your teams time along with the ability to separate emotion from the negotiation and stick to the necessary criteria helping mitigate a rush to finish that could impact the best outcome. What is your company's projected growth rate over the length of the contract? If you don't ask this question, you may end up negotiating terms that work well for your current size but limit your options as you expand. Build scaling into the equation during negotiation so that you end up with a vendor capable of serving you long-term. Some businesses only have an infrastructure capable of supporting smaller organizations, so once you reach a certain size, they are unable to meet expectations. This mistake can add to your bottom line, disrupt your operations and lead to a poor customer experience. Vendor contract negotiations are a necessary and complex part of business operations. Making errors in this process could result in being locked in with partners who are unable to meet your needs or end up being far too expensive. Use this guide to smooth out the negotiation process and get contracts capable of growing your business for many years to come.